The committee members of the Fire Fighters Memorial Foundation of Missouri worked hard to design a fitting memorial to the fire fighters throughout the state who were lost on active duty. In addition to the wall on which were inscribed the names of the fallen, the Foundation envisioned an emotionally-moving sculpture: a mourning firefighter, kneeling in grief with his helmet at his feet. In October 2000 Matthews International Corporation of Pittsburgh received the commission to create the bronze statue. Cast in the firm’s Parma, Italy foundry, the 2,700-pound sculpture was completed nearly a year later, in August 2001. Matthews International had promised the Missouri firefighters that the statue would be delivered in October. Although the bronze was originally intended to be shipped by ocean, Matthews decided to air freight it through New York City to guarantee the delivery deadline. The statue never made it to Missouri. The crate arrived at Kennedy Airport on September 9, 2001 where it was held for customs clearance. Two days later Al-Qaeda-affiliated terrorists flew two Boeing 767 airliners into the World Trade Towers. Emergency responders rushed to the scene in a valiant attempt to save the thousands of workers in the burning structures. Among the 2,573 innocent people who were murdered that day, 343 were New York City firefighters. The entire nation joined New Yorkers in their shock and grief; among them the firefighters of Missouri and the Matthews International Corporation employees. The Fire Fighters Memorial Foundation joined with Dave DeCarlo of Matthews International and offered the statue—which so astonishingly-well reflected the pathos of the event--to the New York City Fire Department and the Federal Law Enforcement Foundation as a gift to New York. On September 17, the day that the Kneeling Fireman was released from Kennedy Airport, the New York Post published a full-page photograph of a New York City firefighter kneeling in the ashes of the Trade Towers. Eerily, the photograph was nearly identical to the bronze sculpture. Earlier that week the Matthews International Corporation produced two bronze plaques in its Pittsburgh plant to accompany the statue. One, the “Emergency Services” plaque includes bas relief images of first responders—policemen, firemen and emergency services personnel—performing their heroic jobs. The second, “America the Beautiful,” depicts through scenes of the Liberty Bell, Mount Rushmore and the Golden Gate Bridge the country which the terrorists sought to destroy . 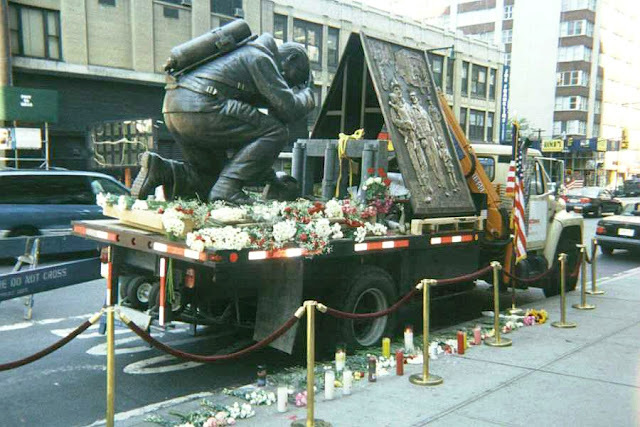 The Kneeling Fireman was temporarily displayed in front of the Milford Plaza Hotel in Midtown. The Milstein family, owners of the hotel and the Emigrant Savings Bank, donated a granite base for the sculpture. The statue became a makeshift memorial as thousands of New Yorkers and tourists left candles, photographs of lost loved ones, prayer books, flowers and notes. The statue was eventually removed, crated and put in storage for nearly a decade. Finally, after complicated discussions and arrangements, on Thursday September 22, 2011 The Kneeling Fireman found its permanent home. Notable members of Federal law enforcement joined FDNY dignitaries and others as Howard P. Milstein, Emigrant Bank Chairman and CEO led the dedication of the statue at the 43rd Street headquarters of the bank. The statue, 9 feet tall and 12 feet long, became the only memorial to 9/11 in Midtown Manhattan. Few who pause before the poignant sculpture could imagine that its presence in New York City as a memorial to those killed on 9/11 is the result of unfathomable coincidence.